Young, Juliette C. Waylen, Kerry A. Sarkki, Simo Albon, Steve Bainbridge, Ian Balian, Estelle Davidson, James Edwards, David Fairley, Roddy Margerison, Ceri McCracken, Davy Owen, Roger Quine, Christopher P. Stewart-Roper, Charles Thompson, Des Tinch, Rob Van den Hove, Sybille and Watt, Allan 2014. Improving the science-policy dialogue to meet the challenges of biodiversity conservation: having conversations rather than talking at one-another. Biodiversity and Conservation, Vol. 23, Issue. 2, p. 387. Redpath, Steve M. Young, Juliette Evely, Anna Adams, William M. Sutherland, William J. Whitehouse, Andrew Amar, Arjun Lambert, Robert A. Linnell, John D.C. Watt, Allan and Gutiérrez, R.J. 2013. Understanding and managing conservation conflicts. Trends in Ecology & Evolution, Vol. 28, Issue. 2, p. 100. Young, Juliette C. Jordan, Andrew Searle, Kate R. Butler, Adam Simmons, Peter and Watt, Allan D. 2013. Framing scale in participatory biodiversity management may contribute to more sustainable solutions. Conservation Letters, p. n/a. Embodied interdisciplinarity: what is the role of polymaths in environmental research? Anbar, M. (1973) The ‘bridge scientist’ and his role. Research/Development 24: 30–34. Baumann, H. (2009) Don't fence me in . . . In: The Social Embeddedness of Industrial Ecology, ed. Boons, F. & Howard-Grenville, J., pp. 48–64. Cheltenham, UK: Edward Elgar. Bradshaw, G.A. & Bekoff, M. (2001) Ecology and social responsibility: the re-embodiment of science. Trends in Ecology and Evolution 16: 460–465. Bruce, A., Lyall, C., Tait, J. & Williams, R. (2004) Interdisciplinary integration in Europe: the case of the Fifth Framework programme. Futures 36 (4): 457–470. Carpenter, S.R., De Vries, R., Dietz, T., Mooney, H.A., Polasky, S., Reid, R.V. & Scholes, R.J. (2006) Millennium Ecosystem Assessment: research needs. Science 314: 257–258. Daily, G.C. & Ehrlich, P.R. (1999) Managing Earth's ecosystems: an interdisciplinary challenge. Ecosystems 2: 277–280. Ewel, K.C. (2001) Natural resource management: the need for interdisciplinary collaboration. Ecosystems 4: 716–722. Fazey, I., Fischer, J. & Lindenmayer, D.B. (2005) What do conservation biologists publish? Biological Conservation 124: 63–73. Funtowicz, S.O. & Ravetz, J.R. (1993) Science for the post-normal age. Futures 25 (7): 739–755. Gibbons, M. (2000) Mode 2 society and the emergence of context-sensitive science. Science and Public Policy 27 (3): 159–163. Janssen, W. & Goldsworthy, P. (1996) Multidisciplinary research for natural resource management: conceptual and practical implications. Agricultural Systems 51: 259–279. Karlqvist, A. (1999) Going beyond disciplines: the meanings of interdisciplinarity. Policy Sciences 32 (4): 379–383. Kinzig, A.P. 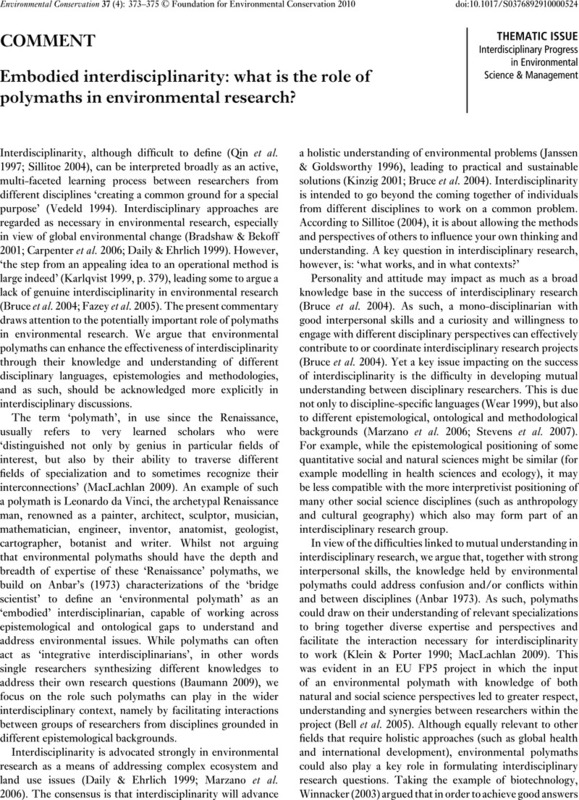 (2001) Bridging disciplinary divides to address environmental and intellectual challenges. Ecosystems 4: 709–715. Klein, J.T. & Porter, A.L. (1990) Preconditions for interdisciplinary research. In: Studies in Interdisciplinary Methods from Business, Government and Academia, ed. Birnbaum-More, P.H., Rossini, F.A. & Baldwin, D.R., pp. 11–19. Oxford, UK: Oxford University Press. MacLachlan, M. (2009) Rethinking global health research: towards integrative expertise. Globalization and Health 5: 6. Marzano, M., Carss, D.N. & Bell, S. (2006) Working to make interdisciplinarity work: investing in communication and interpersonal relationships. Journal of Agricultural Economics 57 (2): 185–197. Nissani, M. (1997) Ten cheers for interdisciplinarity. Social Science Journal 32 (2): 201–216. Qin, J., Lancaster, F.W. & Allen, B. (1997) Types and levels of collaboration in interdisciplinary research in the sciences. Journal of the American Society for Information Science 24 (10): 893–916. Rhoten, D. & Parker, A. (2004) Risks and rewards of an interdisciplinary research path. Science 306: 2046. Robinson, A. (2005) A polymath's dilemma. Nature 438: 291. Sillitoe, P. (2004) Interdisciplinary experiences: working with indigenous knowledge in development. Interdisciplinary Science Reviews 29 (1): 6–23. Stevens, C.J., Fraser, I., Mitchley, J. & Thomas, M.B. (2007) Making ecological science policy-relevant: issues of scale and disciplinary integration. Landscape Ecology 22 (6): 799–809. Vedeld, P.O. (1994) The environment and interdisciplinarity: Ecological and neoclassical economical approaches to the use of natural resources. Ecological Economics 10: 1–13. Wear, D.N. (1999) Challenges to interdisciplinary discourse. Ecosystems 2: 299–301. Winnacker, E.-L. (2003) Interdisciplinary sciences in the 21st century. Current Opinion in Biotechnology 14 (3): 328–331.